On Saturday, April 20th, Nor Zartonk Nederland and Doorbraak will organize a meeting with 2 lectures in the context of the commemoration of the Armenian Genocide. Internationally April 24th 1915 is seen as the beginning of the Armenian Genocide in the Ottoman Empire. On that day Armenian intellectuals were imprisoned, and they were executed shortly afterwards. That was the beginning of the genocide in which 1.5 million Armenians and Aramean Christians were murdered. These victims are commemorated annually, all over the world. However, the Turkish state denies the genocide. The Dutch parliament does recognise the genocide, but the Dutch state has not yet officially recognised it. Considering the actual situation of Amenians in Turkey today, one can ask the question whether the genocide ever really came to an end. The speakers will be Alexis Kalk and Aris Nalcı. Alexis Kalk was born in 1984 in Paris. He grew up in Istanbul and from 2006, together with others, he made the radio program “Anushabur” about the problems of Armenians and other ethnic minorities in Turkey. In 2007 he was involved in the establishment of the grassroots left-wing organisation Nor Zartonk (Awakening again), and in 2009 in the establishment of the multilingual radio station Nor Radio, intended to make repressed languages and identities heard. In 2010 they also founded the Armenian Culture and Solidarity Association to protect the Western Armenian language and culture. 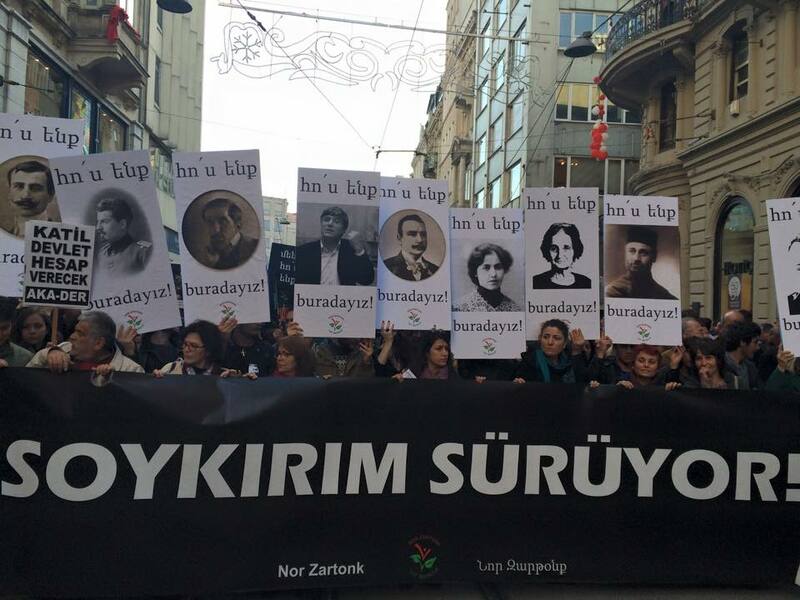 Kalk has actively participated in the struggle for a democratic and equal society, for human rights, peace and freedom of expression, especially around the commemorations of Hrant Dink and Sevag Balıkçı, the recognition of the Armenian Genocide and the resistance around Camp Armen. Aris Nalcı is a journalist and documentary maker. He became active in 1998 when he met Hrant Dink. He started working as a photographer for the newspaper Agos. Even after Dink’s murder he remained active there. He took the initiative to create IMC tv, and there he was the maker and presenter of the first programme of and for minorities: “Gamurc” (“Bridge”). After five years the station was closed by the state. In 2017 he started the Armenian-language radio programme “Belgahay” in Brussels. From 2015 and 2017 he published a series of reports on trips he made through the former Armenian areas in Turkey. His work has been exhibited in Istanbul and the United States under the title “What remained”. 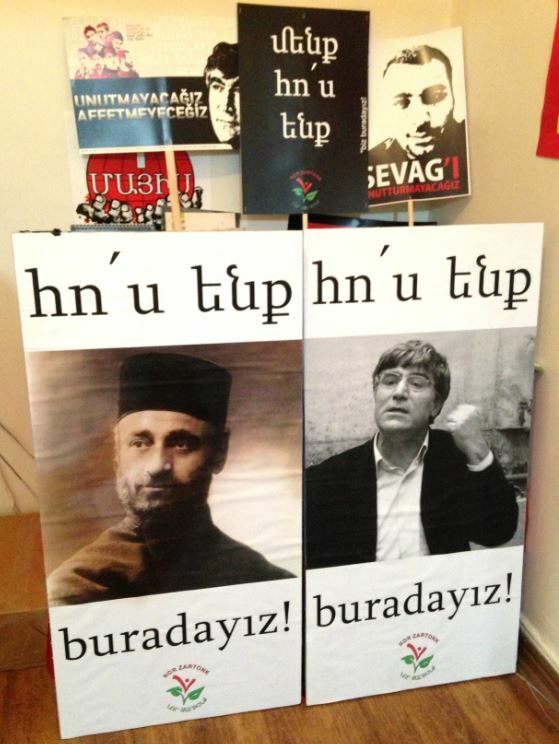 He also translated a book about the Armenian socialist Paramaz and his twenty friends who were hanged in 1915. Nor Zartonk is also active in the women’s en lgbt stuggle. 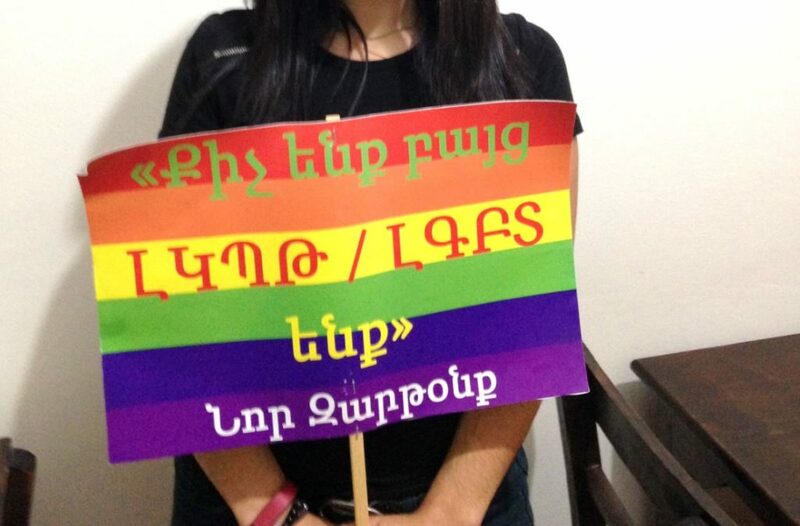 The text reads ” We are few, but we are lgbt”. The meeting is about the genocide and its background, and about the resistance against the oppression and assimilation of the Armenian minority since then. A nationalist policy that also affected and affects Greeks, Jews, Kurds, Alevis and other ethnic and religious minorities. After all, the perpetrators of the genocide were never punished, and the power structures that made the genocide possible were never torn down. Since the Armenian genocide, there have been regular mass murders, pogroms and lynchings in Turkey, particularly against Armenians, Greeks, Kurds, Jews and Alevis. To this day, members of minorities, especially the Armenians, are not sure of their lives when they speak out on the genocide or in favour of human rights for all in Turkey. It is very brave how people like Kalk and Nalcı continue to speak out and also participate in protests like Gezi and Camp Armen. Not only is recognition of the Armenian genocide necessary, but also apologies and compensation. This requires organization, struggle and solidarity. From 15 to 28 April, De Klinker will also host a small exhibition with photo’s of actions of Nor Zartonk in Turkey and other countries. 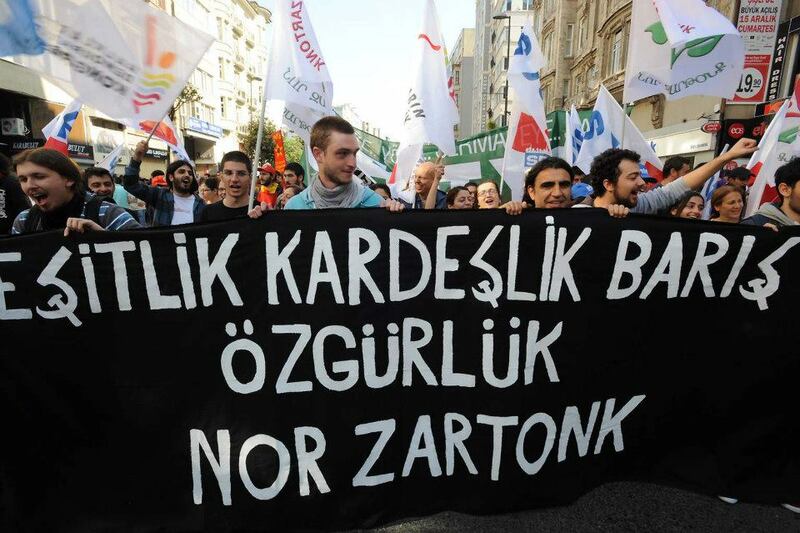 Nor Zartonk banner: “Equality, brotherhood, peace and freedom”.